Talisman Rotary Sieve is a rotary mouli type sieve for sieving large batches of glaze or slip. The Rotary Sieve has a tapered, plastic body which fits firmly on any round container. The handle extension allows it to rest on extra large containers. Push-in screens with moulded rubber rims are interchangeable. Stainless steel screens available in the following meshes: 10#, 20#, 30#, 40#, 50#, 60#, 80#, 100#, 120#, 150# and 200#. Either wet or dry materials can be sieved quickly. For example, dry ash can be put through a screen as fine as 100 mesh. 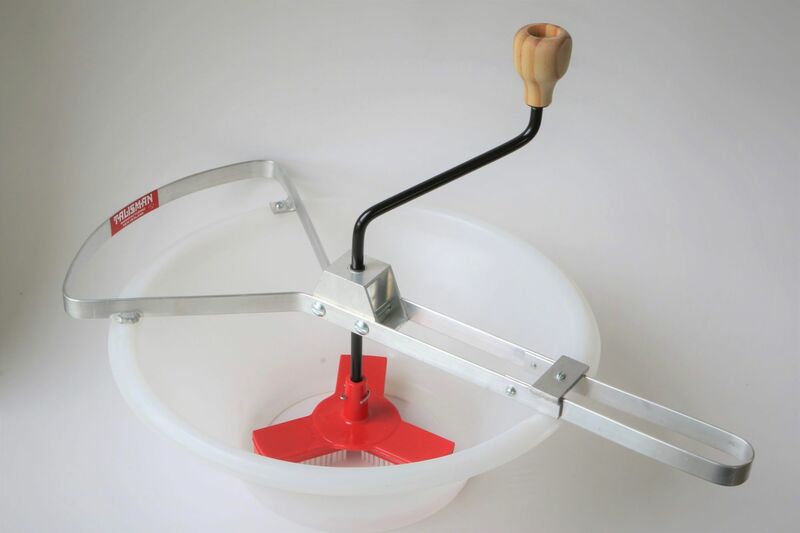 The brush-cluster is rotated against the screen by turning the handle and the pressure required is regulated simply by pressing on the handle as it is turned. Brushes are held in a moulded plastic centre-piece sufficiently tightly to ensure that they maintain contact with the screen even if this distorts with use. Brushes have nylon bristles set in a plastic back; they won't absorb colour and are easily washed. They are long-lasting, yet easily replaced. After use, the screen can be removed and the brush-cluster pushed through the bottom of the sieve for easy washing. The handle is easily removed for easier transport, or if several brush-heads are needed for different purposes - eg, for wet or dry uses. The handle runs in a graphite-impregnated nylon bearing well clear of the abrasive materials being used. When dismantled, the sieve can be sent by parcel post. It comes with clear instructions for assembling.